Wanna make your kids wash their hands? Previous post: Kate Shugak is back. Next post: They aren’t developing opposable thumbs yet, are they? The night-soil collectors, the men who emptied the cesspools at night and then took the waste out to the fields around London to be used as fertilizer, were generally tipped with a bottle of gin. This is perfectly understandable when you learn that the very streets of London smelled badly enough to convince generations of intelligent, educated people who Johnson indignantly declares should have known better that the smell was the problem, not the water. The smell of the bottom of a cesspool was probably a lot easier to take with a skinful of gin. People emptied their chamber pots out the window, into their cellars and into cesspools, and then the cesspools cracked and leaked into wells not a yard away and then into River Thames, which was where London’s drinking water came from. There is a horrifying account from a newspaper in 1849 that describes a back yard full of human waste floating in water, with small boys bathing in it and a little girl carefully dodging the solid waste to dip out a tin cup of water. They let it stand, of course, before they used it, to let the solid particles settle down to the bottom. I was washing a load of clothes when I read that part, and I stopped reading to listen to the sweet sound of that washing machine for a minute. We take so much for granted. 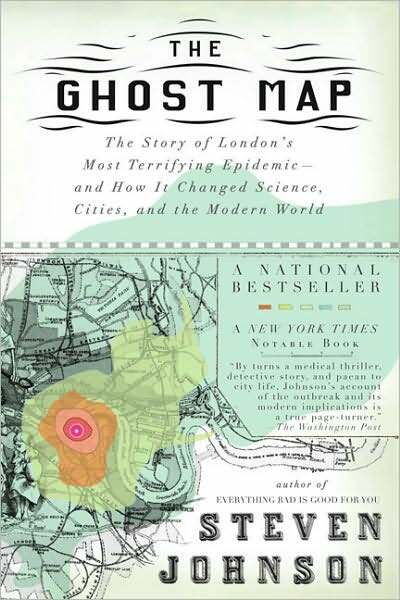 Johnson describes the cholera bacteria in terms that will give you a healthy respect for its reproductive abilities, as well as have you washing your hands every five minutes for the rest of your life, and he draws a straight narrative line between Dr. Snow’s map and the fact that sometime soon after the book was written fifty percent of the people on earth will be living in urban communities. He makes a good case for urban living being green (better health and social services for more people) but he also points out that urbanization also provides bigger targets for superbugs and terrorists (9/11). Dr. Snow’s map eventually causes the construction of the first major sewage system, that is then used as a model for other cities around the world. It will no doubt enrage you as much as it did me to learn that it took years for the establishment to come around (helped along by an event delightfully named The Great Stink), and Snow did not survive to see it. This last sentence is now memorialized on a pin worn by members of the John Snow Society. This is a really interesting read. I’d recommend it to any book club as a great discussion book, to any parent trying to get their kids to wash their hands, and any teacher who wanted to wake up their classroom. I read this when it first came out and had a similar reaction: thank God for clean water! We have NO IDEA how lucky we are. And now as I’m living in an area threatened by devastation to the water table by hydrofracking, I’m terrified. Thank you Dana for your wonderful reading suggestions! I sent eldest into the library to order the book (temporarily put my library card in that safe place) and the librarian raised her eyebrows and thought it too scary for a 12 year old. BOH….. will insist that she reads it all!!!!! I started with John Snow and his work, and ended reminding them they could contribute to public health just by always washing their hands. I still cherish the thank you note that ended and because of you I always wash my hands now”. You and Jon Snow, Tracy. Separated at birth.